Aboveground pools can be partially buried 1′-4′. Burying a pool is called a “frame drop” which does NOT effect the depth of the water in the pool. Changing the depth of the water is called a “deep center”. Generally, we avoid “deep centers” as it increases the chance for wrinkles & a lumpy bottom of your liner. Frame drops are a much better option. And it simulates an inground pool for a much lower cost. Benefits: 1. more attractive to look at water than pool wall 2. easier to climb into 3. cheaper than inground vinyl, fiberglass or concrete pool. Concerns: 1. potential collapse during future liner replacement 2. 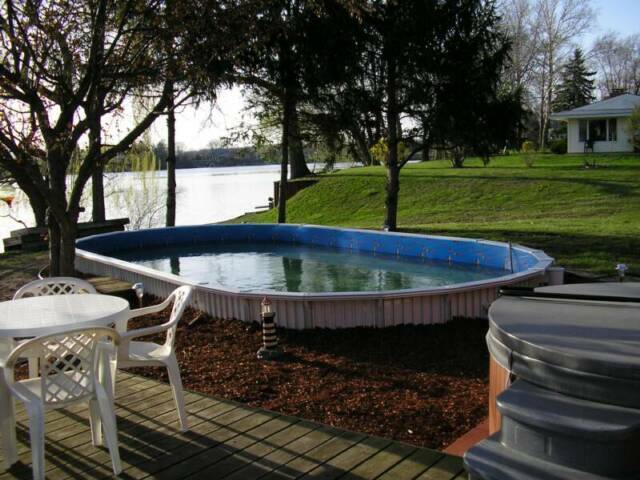 3′ or 4′ frame drop you may need PVC plumbing along with inground pool pump. Aboveground pool pumps are gravity fed. Therefore, they must be below pool waterline. PVC check valves can simulate an inground pool pump. 3. Frame drop pools require tractor excavation. The hole excavation can double the cost of the installation. Despite this risks we’ve installed thousands of aboveground pools with their frame dropped into the ground. Here is the additional price list for the hole excavation to partially bury an aboveground pool.